Every now and then we like to introduce a new face to our blog. This time we are bringing you a guest post by fishyflakes. Though not at all a drama watcher (gasp!) he boasts a very eclectic taste in movies, including American political drama, sitcoms, animation, and horror. In terms of Asian media, he watches mainly action movies and anime, earning himself the title of the classic “boy” viewer (he said this, not us!). Now, will his most recent foray convince him to give more Asian films and dramas a shot, or will it turn him off for good? Let’s find out! Xiao Ming is in love and has already planned out the rest of his live with the girl of his dreams, but there is one problem — she has left him for California! He is determined to get her back though and intends on flying half way across the world to do so. However, because it is peak season, flights are quickly being sold out so his only way to get to her is to purchase a tour package called “Hollywood Adventures” off a shady website. Along the way, he meets fellow tourist Da Wei, a seemingly dim-witted and incompetent man, as well as the tough tour guide Wei Wei. Soon enough he learns that the tour is not as simple as it seems and getting to his girlfriend might be harder than he originally thought. Will Da Wei and Wei Wei come to his aid, or will they only become barriers to his “success”? The movie starts off very standard and run of the mill for a rom-com, but you will notice that things start to get strange very quickly. In not so subtle ways the movie changes from your cookie-cutter romantic comedy into a witty satire of Asian and American films. Of course no one is going to win any acting awards for this movie. But it is both silly and smart at the same time. I especially enjoyed that this comedy that has a very low barrier for anyone trying to explore either Asian or American films. This movie ties together both styles of film by its extremely self-aware jokes. The jokes poke fun at both styles of media and the perception of each culture by the other. As a someone who enjoys American films. I believe that this movie has to be viewed through a certain lens. If you can’t make fun of yourself this is probably not the movie for you. The gags will probably either offend you or fly over your head. 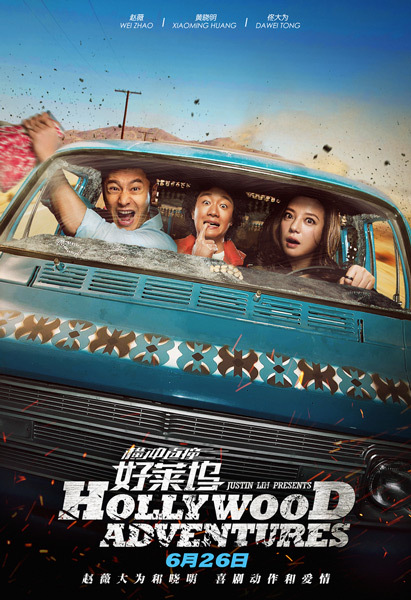 I would recommend this movie for sharing with your Western friend or colleagues to introduce them to Asian media, or if you are just looking for something so ridiculous that you can’t help but laugh. This movie is full of parodies on American movies and includes an impressive list of cameos from the likes of Simon Helberg, Missi Pyle, Omar Dorsey, Brian Thomas Smith, Parvesh Cheena, Bridgett Riley, Stephen Tobolowsky, Robert Patrick, Rick Fox, Kat Dennings, Tyrese Gibson, Hardy Awadjie. Sunny Kang (Fast and Furious franchise) and Rhys Coiro (24, Entourage) played important secondary characters. The total cost to make this movie was $30 million USD. Box office took in $51.62 million, nearly double. Zhao Wei/Vicki Zhao was recently in Tiger Mom opposite none other than Tong Da Wei. Fun fact: She dubbed Princess Fiona in Chinese release of 2004 cartoon, Shrek 2. Tong Da Wei was also in 2014 tearjerker Dearest with Zhao Wei/Vicki Zhao (AMAZING film btw). He played a small role in movie adaptation of Silent Separation earlier this year with Huang Xiao Ming. Though Huang Xiao Ming has long professed to have had a crush on Zhao Wei/Vicki Zhao, he started dating Angelababy in 2010 and finally tied the knot in October this year in a televised wedding that has been compared to the wedding between Kim Kardashian and Kanye West by media. This marks the first time these three best friends have collaborated together! Also first time Zhao Wei/Vicki Zhao and Huang Xiao Ming has played lovers (oops, spoiler! ).